This summer I spent the majority of my time as an LIT or Leader in Training at Camp Newaygo, a girls residence camp in Newaygo MI. As an LIT, I worked as a counselor, taught classes, and helped make the camp experience special for the girls who attended. 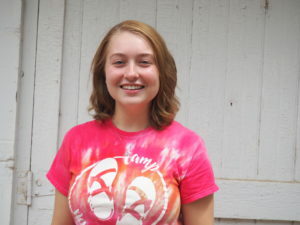 I myself am a long-time camper and the progression from camper to counselor seemed the most obvious path to me. I was very excited to go and the night before I left I laid awake dreaming of what being a counselor would be like. But being a counselor was much different than I thought it would be. For one thing, it was a lot of work. I was in almost constant motion. Teaching classes, cleaning the cabin, setting up for new sessions, picking my girls up from their classes and dropping them off at the next ones, sweeping and wiping up spills, and setting up tables, and doing odd jobs that needed to be done. At first it was tiring, but as the summer progressed I found I liked it; I liked to feel helpful. Even the less glamorous aspects of camp, like cleaning up after a camper when she had an accident in her sleeping bag were rewarding in their own ways. I liked to feel useful and like I was making a difference at camp. The biggest change from camper to counselor though was the change in mentality. As a camper, camp revolves around you, your interests and dislikes, but as a counselor I had to be a lot more selfless. I had to put my girls and other counselors first. Yet, I found I enjoyed helping others and making them happy. I found that it was so rewarding to help a camper succeed. For example, my first week as a camp counselor I had a very sweet camper who was struggling to fit in with the other girls, yet by the end of the week with encouragement and gentle pushing she had become much more social and was making an effort to interact with the other girls. Her victory filled me with pride and joy; it was so rewarding to have helped her succeed. Camp made me a better person. It made me more brave and confident in myself. It taught me the true essence of leadership: that to be a good leader I had to do what was best for those I was leading even at my own expense. Camp forced me to not take myself so seriously and have fun through silly skits I had to perform, ridiculous costumes I had to wear, and mistakes I made that I had to recover from. The mistakes I made kept me humble and reminded me that even though I had been going to camp for years, I by no means knew everything there was to know. The other counselors were always encouraging and accepting of my flaws which allowed me to take risks and grow without fear of rejection. 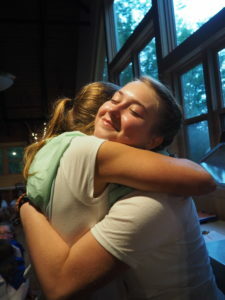 This supportive environment has always been one of the most attractive things about camp to me and as a counselor the feelings of love, support, and appreciation were deepened. The lessons of bravery, humility, selflessness, kindness, supportiveness and more that I learned this year at camp are ones which I have been learning throughout my years as a camper – now solidified as a counselor. I hope to bring all these qualities into my senior year of high school and further – to college, to jobs I will work, and even to my own family someday. Camp has truly impacted my life and hopefully will continue to influence me for years to come. -Guest blog by Audrey Patterson, an L.I.T. from summer 2018. Audrey is a senior at West Catholic High School. She is a member of r the West Catholic Peer Ministry Team, Choir, and attendee of the Kent Technical Center Early Health Careers program.